← The Sound Of Silence! Columbia University Professor Oliver Sacks is probably the country’s best known neurologist. But his greatest talent may be his ability to make the complexities of neurological disorders understandable to laymen while portraying the afflictions of his patients in a compelling and compassionate way. 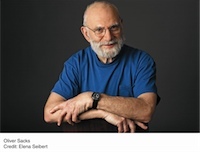 A regular contributor to the New Yorker and the New York Review of Books, Sacks is best known for Awakenings, The Man Who Mistook His Wife for a Hat and An Anthropologist on Mars. His latest book, Musicophilia, has just appeared as a Vintage paperback. 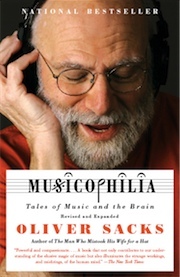 I put six questions to Dr. Sacks about his remarkable study of music and the human brain. 1. Your book begins with a “bolt from the blue,” so to speak, with the story of Tony Cicoria, an orthopedic surgeon in upstate New York whose life was transformed when he was struck by lightning in 1994. Tell us something about Dr. Cicoria and why you decided to introduce your book with his case. When I first wrote Musicophilia, I thought Tony Cicoria’s story was rather dramatic—and unique. Here was a man, a surgeon who never had much interest in music but occasionally listened to rock and roll. One day he was struck by lightning and survived, apparently without any long-lasting problems. But about three weeks later, he developed an insatiable passion for the piano, and for Chopin in particular. He plays daily and recently debuted his own composition, the Lightning Sonata. What had happened in his brain to create this sudden and overwhelming passion for music? Since first publishing Tony Cicoria’s story, I have received many letters from people who were not struck by lightning and seemed to have no special physical or psychological conditions, but, often to their great surprise—in their forties or fifties or even eighties—have found themselves with sudden or unexpected creative gifts or passions, either musical or artistic. 2. Anthony Burgess in A Clockwork Orange tells the story of a young Beethoven fanatic who is “programmed” to be physically ill on hearing Beethoven played. More recently, we have learned that the use of music played a key role in the Bush Administration’s torture program. For instance, this weekend the Washington Post reports that psychologist James E. Mitchell directed that one prisoner be subjected to bombardment by music—he specified the Red Hot Chili Peppers. What is it about music that makes it suitable for use as part of a torture regimen? Music’s power does have a dark side. A daily example of this would be musical brainworms, the annoyingly repetitive musical phrases that may run through one’s mind for days on end. And of course music may be seen as dangerously seductive, as much of our literature reminds us. In Greek mythology, it was the bewitching music of the Sirens that lured sailors to their destruction, and Tolstoy brings up a similar theme in his story “The Kreutzer Sonata.” Using loud music as torture draws on these qualities of music, as well as simple sensory overload. I personally find the assault of loud public music—in stores, restaurants, airports–a minor form of torture. One wants to listen to one’s own music, in one’s own way, not to have it force-fed, especially at great volume. I once invited the poet W.H. Auden to one of Kitty’s sessions, and he was amazed by the instant transformations which music could effect; they reminded him of an aphorism of the German Romantic writer Novalis: “Every disease is a musical problem; every cure is a musical solution.” This seemed almost literally to be the case with these profoundly parkinsonian patients. 3. You also talk about aphasia—a condition in which there is an impairment of speech and speech comprehension—and note that music is being used as therapy for aphasia patients. Can you explain this and tell us how promising the therapy is? Are there other areas in which music has therapeutic value? This is a very specific use of music therapy, but there are many others. People with Alzheimer’s or other dementias will often respond to music even when they are able to respond to little else. Music, especially familiar music from one’s early years, can help to orient and organize such people. Music works because it engages so many parts of the brain. Rhythm, actual or imagined, activates areas of the motor cortex, crucial in synchronizing and energizing movement—whether for athletes or people with movement disorders like Parkinson’s disease or Tourette’s syndrome. In Musicophilia, I described a man who has incessant seizures, which only stop when he plays music, though this is a highly individual thing, for some people with epilepsy may find that music of a particular sort can actually trigger seizures. By and large, though, there are few, if any, bad side effects of music, and music can often work where no medications can. 4. You suggest that we favor language as our primary medium for the communication of ideas, but your book develops the case for music as another important vehicle. Doesn’t this suggest that music and language have the potential to reinforce and support one another as media of communication? There is a great deal of debate about the relationship between music and language, and speculation about which capacity evolved first. It has often been suggested that music emerged as a by-product of linguistic capacities. But musical rhythm, with its regular pulse, is very unlike the irregular stressed syllables of speech. We will probably never know the answer here, but whether parts of the brain evolved specifically to process music, or music happened to make use of neural pathways that arose for other reasons, it is clear that music has been central to the human enterprise for 40,000 years or more. Bone flutes, some of which date back even further than this, have been found at Neanderthal campsites. Sharing music is one of the most powerful ways humans bond together, and this has obvious survival value. We still use music in this way, to come together in singing religious songs, holiday music, national anthems, protest songs, even “Happy Birthday.” If we had a time machine, it would be fascinating to learn how early music and speech came together in the form of song. Steven Mithen, in The Singing Neanderthals, proposes that speech and music developed simultaneously, as a sort of song-speech, which later separated into spoken language and music. 5. I recently visited a vineyard south of Siena in Tuscany in which Mozart music was being piped day and night into the fields of Sangiovese grapes, part of an experiment to see if this would improve the quality of the local Brunello. I sampled some, and it was divine. But this brings us to the question of the “Mozart Effect”—the claim that exposure to certain kinds of classical music can stimulate the development of different areas of the brain. This has been popularized with CDs and books, but some scientists challenge the idea that listening to some kinds of classical music makes you smarter. Where’s the substance and where’s the hype on this? There is a tendency in philosophy to separate the mind, the intellectual operations, from the passions, the emotions. This tendency moves into psychology, and thence into neuroscience. The neuroscience of music, in particular, has concentrated almost exclusively on the neural mechanisms by which we perceive pitch, tonal intervals, melody, rhythm, and so on, and, until very recently, has paid little attention to the affective aspects of appreciating music. Yet music calls to both parts of our nature—it is essentially emotional, as it is essentially intellectual. Often when we listen to music, we are conscious of both: we may be moved to the depths even as we appreciate the formal structure of a composition. Whether Mozart can influence grapes, I do not know. (Darwin, famously, played music to his earthworms, to see if they would respond; alas, they did not.) Certainly Mozart is sublime, and whenever I listen to his music, I feel something which only music, and only Mozart, can provide. But the so-called “Mozart effect” is another matter. In the early 1990s, Frances Rauscher and her colleagues at the University of California at Irvine conducted experiments to see whether exposure to music could modify cognitive powers such as spatial visualization. They tested their subjects after listening either to silence, to “relaxation” music, or to Mozart (music of other composers was not tested). Rauscher and his colleagues published several careful articles in which they reported that listening to Mozart did enhance abstract spatial reasoning, though only temporarily. The Mozart effect, as this was subsequently dubbed, aroused scientific controversy, and it also attracted intense journalistic attention and exaggerated claims beyond anything intimated in the researchers’ original modest reports. But what is beyond dispute is the effect of intensive musical training on the young, plastic brain. Although a teaspoon of Mozart may or may not make a child a better mathematician, there is little doubt that regular exposure to music, and especially active participation in music, may stimulate development of many different areas of the brain. Takako Fujioka and her colleagues, for example, looking at children with a single year of violin training (compared to children with no training), recorded striking changes in activity in the brain’s left hemisphere. In terms of brain development, musical performance is every bit as important educationally as reading or writing. 6. To what extent are some of the problems you identify, like earworms, a modern phenomenon that have developed with the technologies that allow music to be stored and broadcast? An interesting corollary is that our exposure to different types of music, and hence our musical literacy, has certainly expanded, but perhaps at a cost. As Daniel Levitin has pointed out, passive listening has largely replaced active music-making. Now that we can listen to anything we like on our iPods, we have less motivation to go to concerts or churches or synagogues, less occasion to sing together. This is unfortunate, because music-making engages much more of our brains than simply listening. Partly for this reason, to celebrate my 75th birthday last year, I started taking piano lessons (after a gap of more than sixty years). I still have my iPod (it contains the complete works of Bach), but I also need to make music every day. This entry was posted in Uncategorized and tagged brain, development, Harper's, impact, Music, musicophilia, neurologist, oliver, questions, sachs, six, technology. Bookmark the permalink.